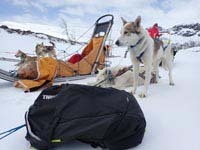 Bob and Sofia from the Nature Travels Team try out the Capstone 32L backpack from Swedish manufacturer Thule on a weekend leisure trip to Poland and a short dogsled tour in Norway. If, like me, you traditionally associate the “Thule” brand with roofracks and cycle carriers, then you might be surprised to learn that they also make backpacks. Which, when you think about it, makes sense since they specialise in solutions for load carrying! So when the nice people at Thule offered us the chance to test their Capstone 32L pack, we were excited to see if Thule’s reputation for durable, high-quality vehicle accessories would translate into the world of outdoor kit. 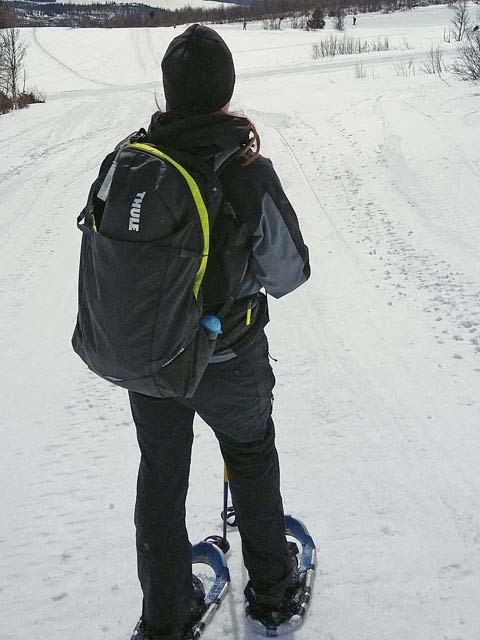 Plus, Thule is a Swedish company (from Malmö in the far south of Sweden), and we do have a soft spot for Nordic gear! The Capstone fits easily as hand-luggage. Photo: Sofia Nature Travels. We received the male version of the Capstone pack (there’s a female fit also) and decided to put it to the test in both “town” and “country” settings. Initial impressions were of a very smart-looking pack that seemed like it was built to last (the zips for example are great – I’m a bit fussy about my zips…). Like the country it comes from, it’s not brash or flashy, but has an air of understated quality. First up was a private (rather than work-related) “hand-luggage” only weekend citybreak to Warsaw in April to visit a friend. 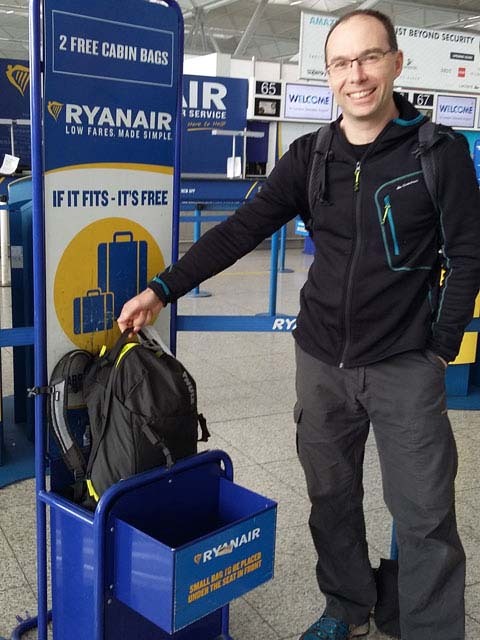 We were flying Ryanair, and given their reputation for being rather strict with staying within their luggage limits, we figured it would be a good test of the Capstone! 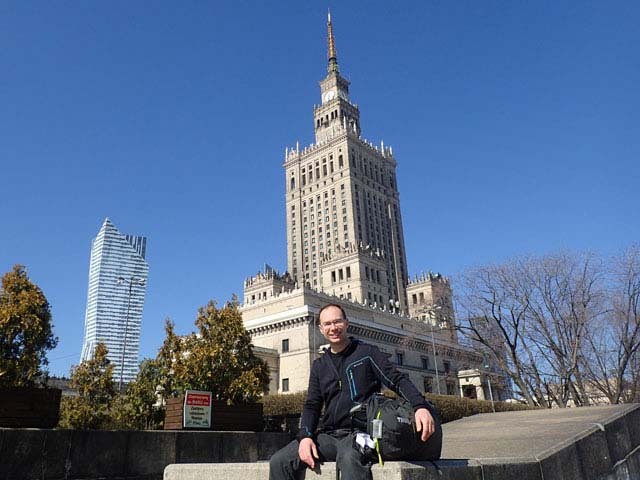 Exploring the delights of Warsaw in early spring. Photo: Nature Travels. The Capstone was the only luggage I was taking, and I had no problem getting all the normal stuff in. In fact I had bit of space left over to fit in a couple of small souvenirs on the return flight. Adjustable back systems on a pack of this size aren’t that common, and at first I wondered if this would be a bit unnecessary for a 32L pack given that the weight carried will never be that much. But the adjustment is quick and easy and I did actually find it made a difference to the overall comfort – plus it makes it easy to share your pack with a shorter or taller friend! Is Warsaw this sunny all the time? Photo: Nature Travels. The top pocket is perfect for quick-access items when travelling such as your liquids for airport security. I also liked the “shove-it pocket” (good name!) at the front which, as the term suggests, is meant for storing bulky items such as your jacket on the outside of the pack where they can be easily reached. Although it hasn’t rained yet while we’ve been using the pack, there is also an integral (and hi-visibility – good for cycling perhaps) raincover, which is a nice touch. The side mesh pockets are great for a water bottle and can be accessed as you’re walking without taking the pack off (some other packs place them annoyingly too far back just out of reach). The demo video shows the button hole webbing in the side of the pack being used to attach a waterbottle with a carabiner. Personally, I’m not a fan of hanging items off the side of a pack to bump around, but this is of course a personal thing and it’s nice to have the option. Overall, the Capstone worked really well as the only bag necessary for a short trip of this kind. Just the right size to bring everything you need and stay within the hand luggage limits. 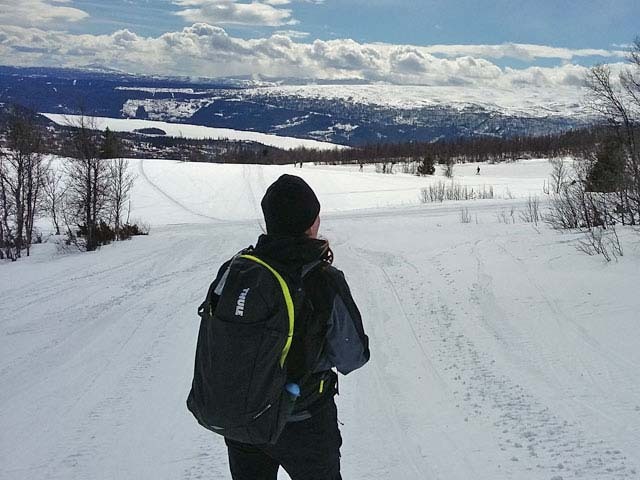 After the glorious sunshine of Poland in early spring, it was a change of scenery for the Capstone to be taken on a 10-day work trip to the mountains of Norway, travelling between Oslo and Bergen by train and doing various activities in between. Here, winter was lingering even longer than normal and there was still plenty of snow around in the mountains even in early May. With its generous sizing, the Capstone makes a good winter daypack. Photo: Nature Travels. This time it was Sofia’s turn to try the pack, taking it as hand luggage and for use as a daypack during the activities in combination with a larger holdall as checked baggage. The Capstone is part of Thule’s “Hiking Backpack” range and so predictably is more suited to outdoor use than being an everyday about-town or going-to-the-office pack. The breathable back definitely makes a difference when you’re being active, considerably reducing sweaty-back syndrome, but on the other hand making it less easy to carry a laptop or keep documents flat (but there’s a dedicated range of “Laptop Backpacks” too for more urban applications). 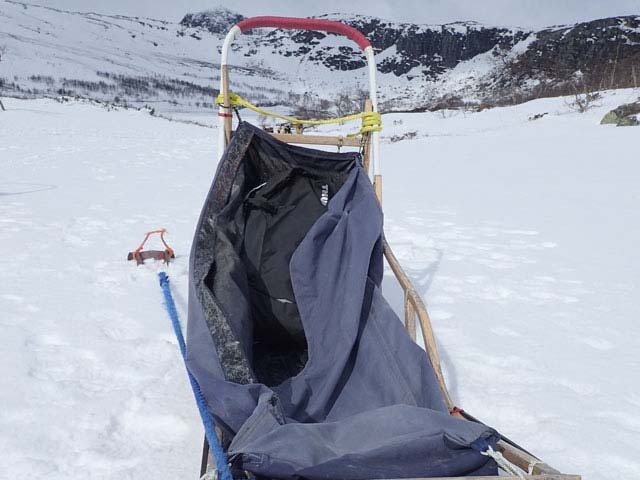 Any piece of luggage which fits well in a dogsled goes down well with us! Photo: Sofia Nature Travels. Since Sofia’s itinerary required being out and about during the day in winter conditions, so carrying bulkier items than you’d take in summer, the 32L capacity of the Capstone worked really well as a daypack for the tour as a whole and especially for the snowshoeing and dog sledding components of the trip. Any bones in there? 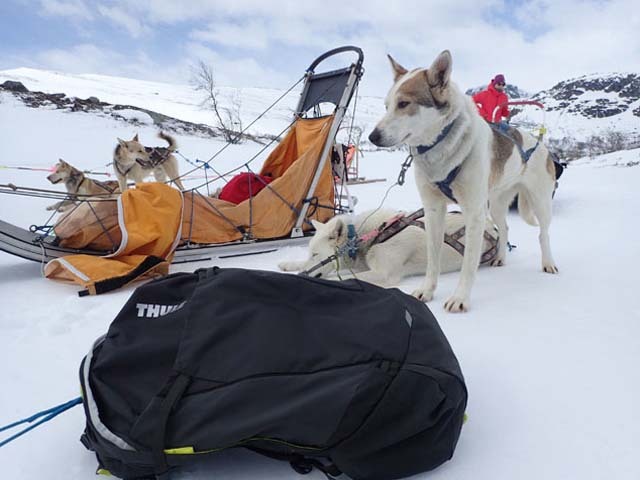 The Thule Capstone 32l is eyed enviously but one of Sofia’s huskies! Photo: Nature Travels. One more unusual feature of the Capstone is the “Versaclick” hip belt feature. As standard, this comes with an attachment for carrying hiking poles. Personally, we weren’t sure about carrying poles horizontally in that way, though it could work well provided you’ve got plenty of space around you to avoid poking your fellow hikers. That said, poles or an ice-axe can also be attached to loops at the back to carry vertically if you prefer and there’s a range of other “Versaclick” accessories such as camera holders to purchase separately, which might prove more useful. Enjoying the views on a snowshoe tour. Photo: Nature Travels. We also didn’t find we used the small zip pocket in the hip belt – it didn’t seem quite big enough for the things we may have wanted to have there like a phone or wallet, but could be useful for snack bars or maybe a set of keys. The Capstone 32L is a really solid and comfortable pack and ideal for being your only bag on a “hand-luggage only” short break or as a daypack for a day activity in the outdoors when you need to bring a reasonable amount with you (extra clothes, thermos/packed lunch, etc). The 32L model is a little too large for some daypack applications, but there’s also a 22L version available if you want something smaller. Retailing at around £99 (though currently available for just £75 or so from some outlets, which is a bit of a bargain we think), the Capstone is not a cheap pack, but we firmly believe that it’s well worth investing in quality outdoor gear that is going to last – the Capstone appears very well-made and feels like it should give years of service. We liked it! We’re also going to be trying out the larger 50L version of the Capstone on a trip to the Stockholm archipelago in June, so watch this space! ← What’s the Difference Between Canoeing, Kayaking and Packrafting?